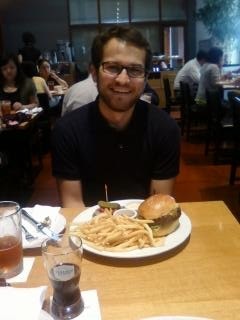 Today I had lunch with my buddy and former classmate "Kobayashi". We first met in the Japanese department, studying (mostly over beers) at the Japanese conversation table in the Memorial Union. August 8th being his birthday, we met up for a pre-birthday luncheon to discuss the weekend birthday plans. 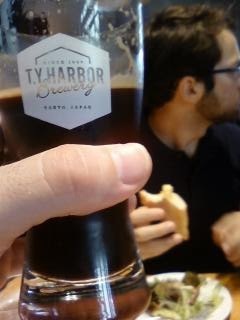 Nick chose TY HARBOR in Shinagawa (Tokyo). Turned out to be an awesome choice. 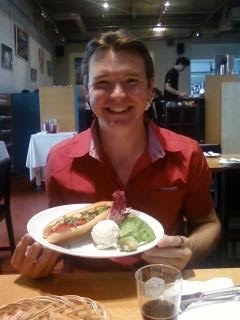 It's a decent enough restaurant, spacious, the food and service were excellent. 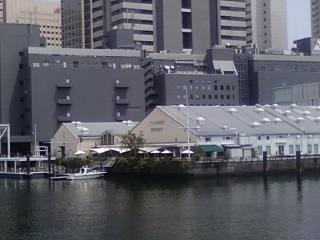 They have their own microbrewery on-site. This was, of course, the main attraction for us both. Nick tried the IPA and I had the Imperial Stout. Both were pretty good. The stout had a good balance of the coffee and creamy tastes one often uses to describe a typical stout. The IPA, according to Nick was comparable to another one of his favorites, Hoppalicious. Located right on the water, this converted metal factory is worth a look. Average price for lunch with a small draft beer is around 2000 yen and goes up from there. Yeah, its definitely a bit pricey but not bad by Tokyo standards. 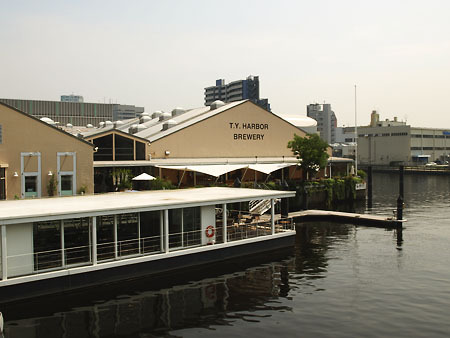 And they have a bakery, a bar, outdoor dining area, and a floating lounge on site with Happy Hour from 5pm-8pm M-F.
Gotta love this pairing: Burger with 1000 Island Dressing and fresh fries with a decent IPA. A recipe for summer; a recipe for success! I had the shrimp po-boy and side of potato salad with a creamy Stout to wash it down. Delicious! The lunch set came with iced tea, side salad, and all-you-can-eat bread basket.